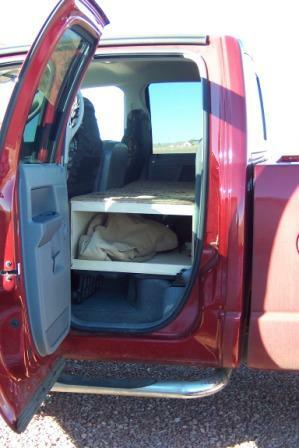 If you have any dogs that travel with you in your truck, an RV Dog Deck is something they might really appreciate, and you too! 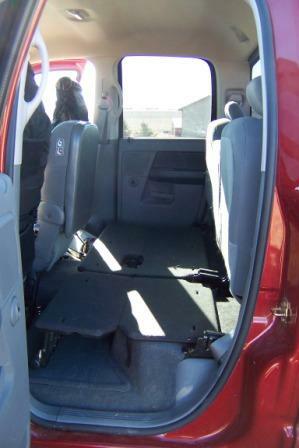 Before I built the RV Dog Deck for Lily and Buck, they couldn't see much from down there on the floor in the back of the cab. 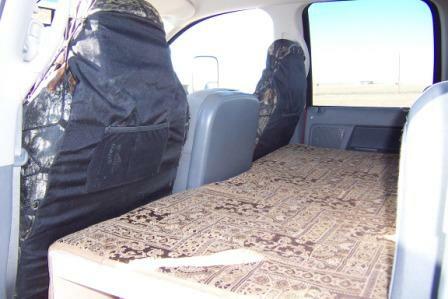 With them ridin' in the back seat there was also no place to put jackets or lunches and such. Everything gets muddy when the weather's bad and hairy when they're sheddin'. You know the drill. 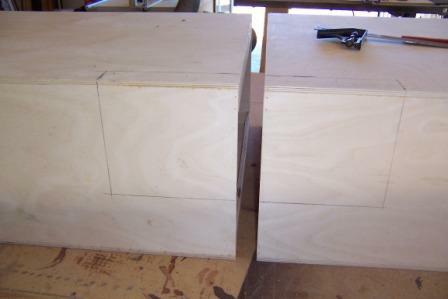 So along with making the ride better for the dogs I wanted to add a little RV storage capacity as well. I didn't find it too hard to come up with a design for the Dog Deck. Me bein' such a confounded genius and all! 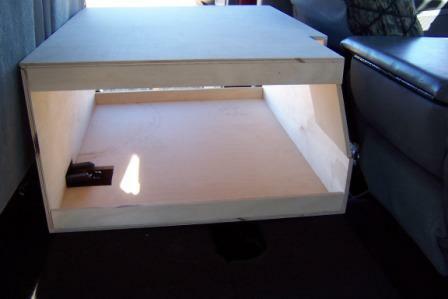 Unlike how I did the deck in the Ol' '98, I layed this RV storage compartment out to leave the factory seat in place. 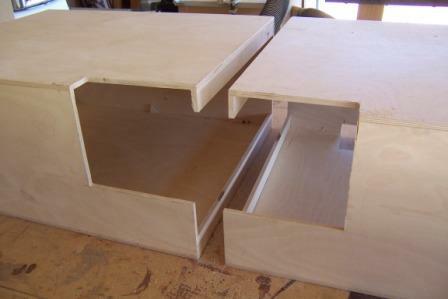 With the combination, RV cabinet, RV Dog Deck built in two halves, I can quickly take it out or put it back in. I figured we may wan't the capacity to haul some friends into town for supper or such one day! Especially if they're offerin' to foot the bill for the steak! 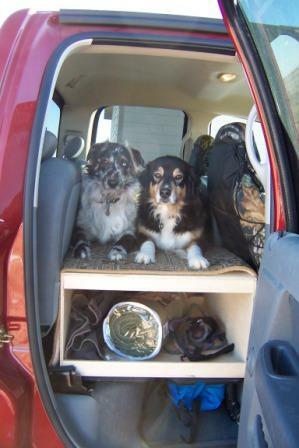 With this RV Dog Deck / Rv cabinet design it only takes a minute to pull them out if I need to. My first attempt to fit them in place revealed a couple of trouble spots. If I tried to raise the center console it hit the front of the RV Dog deck and would go no higher. Also, there's a part of the factory seat on the floor of the driver side that was trying to occupy the same space as the box on that side. 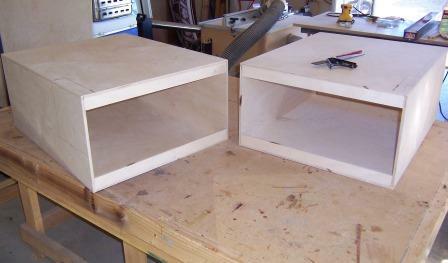 With the tailoring of the Dog Deck boxes completed I took 'em back out to Big Red and did a test fitting. They fit just perfect. 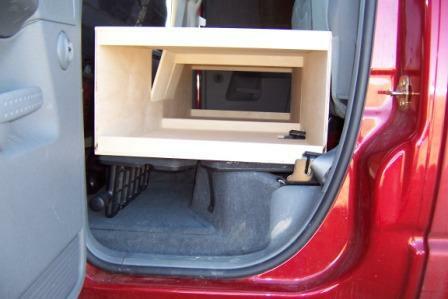 The console can raise up now and the drivers side box drops down over that piece coming up off the floor. After the RV Dog Deck boxes were set in place, I just put down one of the dog blankets we got some time ago at Costco. Same ones we used in the '98. 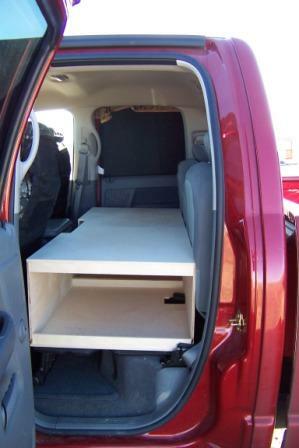 Makes a nice spot for the dogs as well as opening up plenty of RV storage space underneath for camera cases, our jackets, lunch, or really short people! That RV storage compartment is out of sight in parking lots, for a little more security, and out of reach of the dogs ..... just in case they have the urge to do a little "inappropriate" gnawing. That will keep us all getting along better! Lily and Buck sure seem to like it. The new RV Dog Deck raises 'em up high enough to see out the windows now as we roll down the road. They don't have to feel like they're in a dungeon, down there on the floor any more. 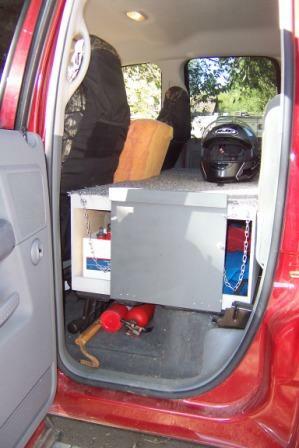 Some day, if I'm feeling really ambitious, I may even paint this RV storage compartment gray to match the interior of Big Red. But considering my recent experience with paint of that sort of persuasion, (doing the hitch maintenance) I'm gonna hold off for a mite! After I thought about it some, I had to agree. It would be sort of like me jumping off the roof of our Eagle a couple times a day. I'm pretty sure I'd be sore after the first impact. I cogitated on it for a while... 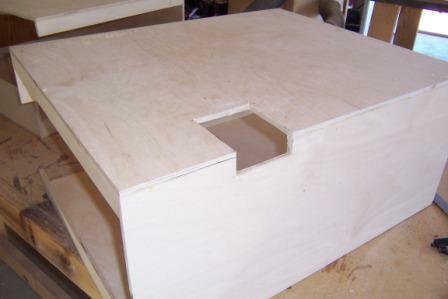 Tried a couple of removable ramp ideas... they were all too cumbersome and awkward. I finally conjured up this setup. It cuts the distance to the ground by almost half, by allowing them an intermediate step. 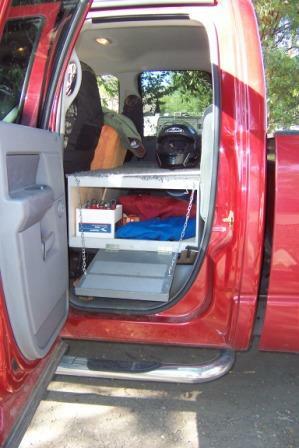 That makes it easier for them, both getting in, and out, and creates little problem accessing the storage compartment in the 'deck' itself. It's quick and can be raised or lowered with one hand in a pinch. It's pretty hard to see in the picture, but in the top, right hand corner of the 'Ramp Up' Pic, I used a simple screen door type, hook and eye to latch it up. Since I have added this ramp the 'Kids' have shown no soreness, and no hesitation jumping in or out... like they were starting to. If you're thinking of adding a deck for your 'Kids', consider this little addition to it as well.